I spent the early hours of Sunday morning on the top floor of a parking garage in Winter Park, Florida. I stood hunched over my tripod – binoculars around my neck and towel draped over my head to cut the glare. I looked ridiculous, but it was worth it. Only 20 feet away, the width of a narrow street, was an osprey nest. A photographer friend tipped me off a few months ago, relaying that if I headed to the top floor and looked down over the Panera umbrellas below, I’d spy the ospreys at eye level. I spent an hour there — snapping pictures, but mostly just gazing at mother and hatchling. Resting on a huge platform above a utility pole, the nest overlooked Winter Park’s trendy Park Avenue. Droppings decorated the sidewalk below in a perfect white circle. Mom and Dad osprey repeatedly shattered the weekend morning quiet with their unmistakable chirpy whistles. Cars rumbled over the brick road below, churchgoers parked and walked to the mass starting a block away. But no one noticed the nest. I’m pretty observant, but it still seemed strange that not a single passerby even looked up. I am sure that a few people noticed the nest recently, perhaps even climbing the five flights to the top of the parking garage for a better view. But I am also sure that the majority of people walk right by. Which begs the question: how much else do we miss? I tend to agree with E. O. Wilson’s idea of biophilia — that (simply put) humans exhibit an innate love of other living things. While not everyone is, like me, a complete bird nerd, I have never met someone whose interest was not piqued by some living thing, even if it was only a pet goldfish. Our biophilia can be satiated, even in the suburbs, by the simple act of looking beyond our own feet. Notice the fish-head on the sidewalk, or search for the source of the birdcall. During my two weeks in Florida I saw over a dozen different nests, most glimpsed from car windows as I drove about my business. I also watched an osprey fishing –– dive-bombing its prey so fast that the bird was entirely submerged before emerging again with his catch. In the lake-spattered state of Florida, these fish hawks are everywhere. 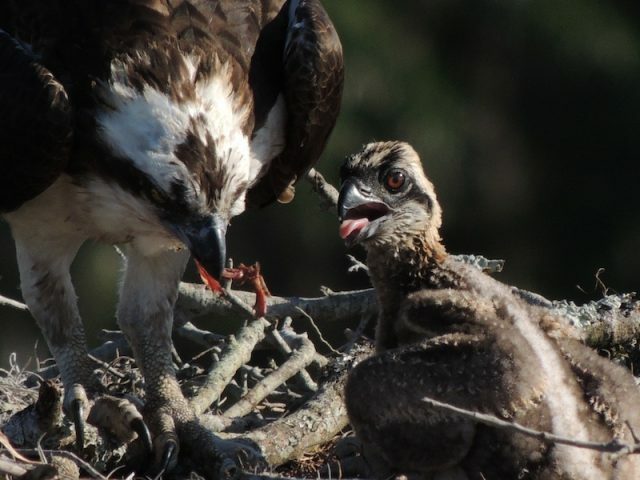 Like the emblematic bald eagle, ospreys have rebounded tremendously since the ban of DDT. Nesting platforms like the one off Park Avenue provide critical space for ospreys, but they also provide an equally critical means to witness wildlife. I notice the osprey everyday while on my dailey duties in Lake county, Florida. It amazes me everyday how such beautiful birds can survive up high upon Power poles and cell towers while the hot busy streets are full of people and cars below. I remember a few months ago I was on my way to work in the early morning hours and low and behold a magnificient bald eagle landed high up on a power pole. I watched intently and wondered if anyone else saw what I did or were they too busy sipping their coffee and listening to their favorite radio station as they ride along to work. Always on the look out for something wild. while visiting the Hosmer Morse museum in Winter Park Florida with my wife on August 13, 2013 I noticed the nesting platform on top of the power poll across from the museum. I wondered what it was for as I have seen similar structures in my Home state of Ohio built for bald eagles. After several days I remembered seeing the nestint platform and found this post on line. We didn’t see the birds but it was great to know that someone cared enough to have provided for them.